Most start-ups are lucky to find investors who can take their idea to an achievable and influential level. Magic Leap, an augmented reality startup, can boast of a meteoric rise with a valuation of $4.5 billion in only 2 years. Big names such as Sundar Pichai, CEO of Google, and filmmaker Peter Jackson in its portfolio have only fueled its rise. Magic Leap’s evolution can be measured by the magnanimous $793.5 million capital it raised in February with investors such as JPMorgan, Fidelity Management, Alibaba, and Warner Brothers. The mere backing of these giants is enough to keep the buzz around it alive even though its projects are under wraps with no definite timeline for release. Peter Jackson, who serves on the advisory panel of the company, believes augmented reality (or mixed reality) will scale new technological heights when compared to virtual reality. He has said technologies such as mixed reality are much more exciting and flexible as they add elements to the real world rather than take you to a whole different one. The Lord of the Rings director further added that mixed reality is completely different from and not an extension of 3D movies. It is the process of creating the illusion of objects wherever you want. This, he says, can open new doors in the entertainment and tourism industries. With Magic Leap glasses on, you can watch the Empire State Building being constructed from its foundation to the apex, but faster or you can, maybe, experience Chicago in a whole new way with gangsters driving past you. Jackson is optimistic about the reach of mixed reality in the education sector as well and expects the technology to become as common as smartphones in 10 years. Recently, the company released a new video shot using technology developed by it. The video features “never-before-seen applications” of augmented reality without the use of special effects or composition. 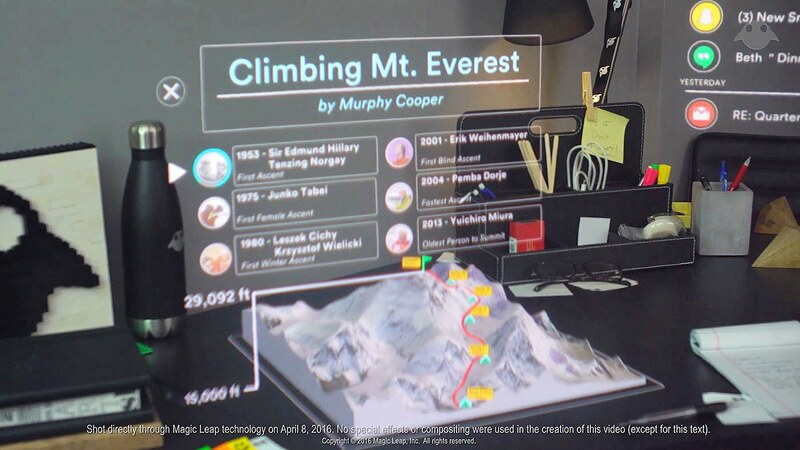 In the video, you can see a number of floating graphics and notifications, Mount Everest in 3D with a few statistics above, and a school of jellyfish swimming across the room. With this video, the company demonstrates the potential of MR.
MR still has a long way to blend into the mainstream because of its lack of consumer products. Support for the technology, however, is significant and can help boost the concept to actuality faster. Rather than participating in the race and build a product, the company has chosen to dedicate time to creating captivating MR experiences.